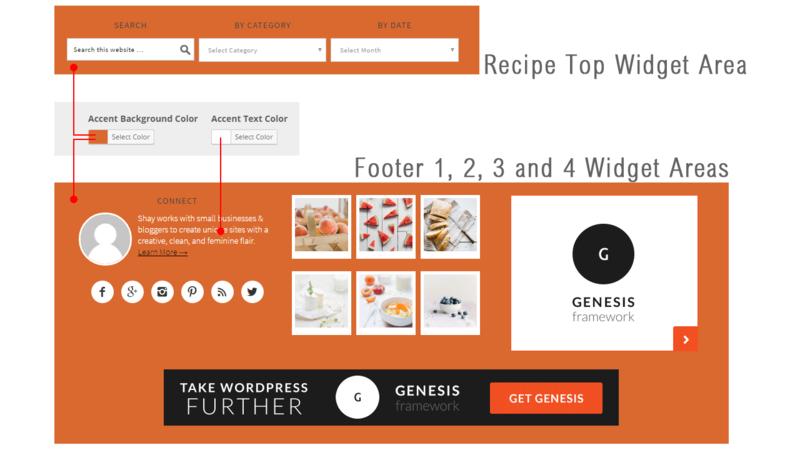 This tutorial is about the Recipe Top and the Footer widget areas, in Foodie Pro. I will show you how to change the background color and the paragraph text color in these two widget areas. There are two big blocks of color that you can easily change in Foodie Pro. Action referrers to a call to action. So it’s easy to remember that Action Background Color is the background color of the main call to action box. This displays at the very top of the site. Action also refers to the eNews widget which is another obvious call to action. Footer block, containing Footer 1, 2, 3 and 4 widget areas. So far this is easy. But you’ll notice the color of paragraph text has changed but the color of the headings and links in these two areas has not changed. You need a simple copy and paste code snippet to change those. I’ll show you how to do that in another Foodie Pro video.